It’s hard to describe the amount of detail that goes into a wedding but when you mix in the element of traveling to a foreign country, the degree of difficulty goes to a new whole new level. If you’ve ever planned a trip, you know how much arranging has to be done in advance. Even for the most spontaneous traveler, things like flights and accommodation by themselves can be a stressful and expensive endeavor to organize. But with all the added levels of complication, a wedding outside your local area is more than worth the toil in the end. As a destination wedding photographer, I have insight into both sides of the planning, from seeing timelines and arrangements of how a wedding will unfold before it happens to the actual planning of a trip to a foreign country. Both, individually, are enough to keep a bride up at night so my goal is to provide a guide to how exactly to best prepare for a destination wedding whether you got engaged last week or are months into planning. My favorite aspect of a destination wedding is that the world becomes your oyster. Being able to roll a dream vacation and a wedding into one is an absolute privilege and as an advocate for travel, I couldn’t recommend it more. The challenges of having a destination wedding over keeping it domestic are far outweighed by the story of a bohemian Tulum wedding designed the exact way you envisioned and providing a once-in-a-lifetime experience for you and your guests. With so many options it’s hard to narrow down exactly where on earth you’d like to have written on your invitation so I’d like to offer up a handful of suggestions to help give an idea of what you might be looking for. I would primarily call myself a Mexico destination wedding photographer and for good reason. Mexico is an absolute dream and although somewhat popular, I’d still consider it an underrated place to go for a destination wedding. An immediate pro of choosing Mexico is one for your guests; a flight into many Mexican cities is almost as cheap as a domestic flight from most major US cities. In the wintertime, I can almost guarantee your entire guest list will be RSVPing ‘Yes’ for any number of the gorgeous beach towns in Mexico in order to escape the cold and enjoy the temperate beauty of most popular Mexican destinations. Cancun, for example, doesn’t usually get colder than 70 degrees even in the middle of winter, as is the case for most of coastal Mexico like Playa Del Carmen and Puerto Escondido. Beyond the beaches, Mexico has both bustling global cities like Ciudad De Mexico and vibrant towns like Guanajuato, which is an absolute gem of a place. Our neighbor to the south is also very inexpensive compared to the majority of American cities and the cost of a destination wedding is mitigated by that fact alone. As a potential bonus, if you have a Latin background, your family will feel at home in a Spanish speaking country. If you’re considering a Mexico destination wedding, here’s a quick guide for where to get married in Mexico. 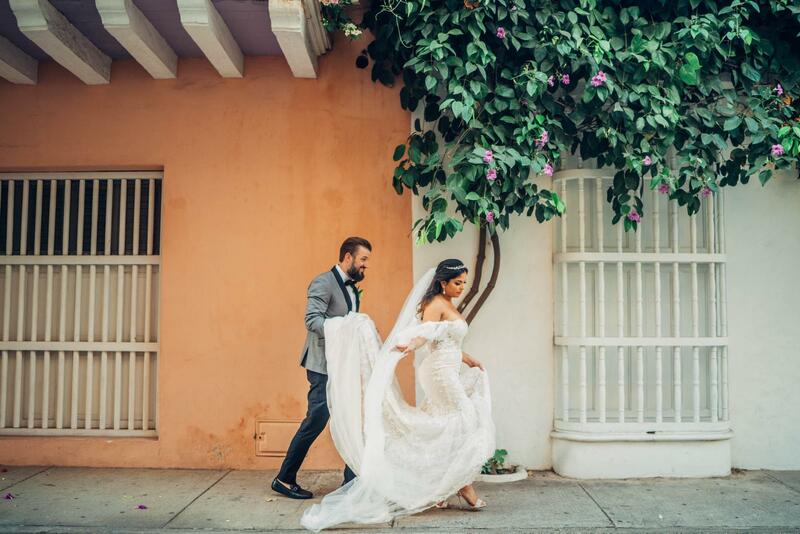 Mexico is absolutely brimming with culture, so if you’d consider yourself more adventurous than the average couple and care about your wedding being an experience to remember, you’ll find a more than enough options in Mexico. Greece is one of the most popular countries for a destination wedding and once you visit, the reason becomes perfectly clear. Beyond being unbelievably beautiful, the culture of hospitality and friendliness makes a foreign country with a language most don’t know feel right at home. Littered with unique islands to choose from, and accompanying wedding venues, Greece destination weddings are hard not to get featured in blogs because of how great they look in photos. The famous eggshell white of Greek buildings perfectly complements the white of a wedding dress in a way that’s hard to replicate anywhere else. Being able to call myself a Greece destination wedding photographer didn’t feel quite solidified until after shooting in Santorini, something I’d always imagined for myself but couldn’t believe I actually got to do! The bride and I are still friends to this day, and I can’t help but think it’s in large part because of the magic of Greece. I couldn’t suggest it anymore and if I’d say a Greece destination wedding is a good fit for you if you would call yourself a romantic, like to explore towns by walking, and you love the sea. I can safely assume most people reading this are based in the United States but I wouldn’t cross off this prominent SoCal city as a place to consider tying the knot. Los Angeles has a great deal of variety in its geography, meaning the city has such a diverse array of options for any couple, along with the rest of California. Los Angeles would feel comfortable because it’s still in the states but it’s foreign enough to feel like a getaway for most of the country either living in the midwest, the east coast, or the south. Even while living in San Francisco, only a 6-hour drive away, I felt like I was “getting away” when I was invited to my friend’s Los Angeles destination wedding. From some of the best beaches in the world to the trendy downtown lofts and warehouses to the swankiest venues ever built, the full spectrum of what a wedding can be is able to be explored in the city of Los Angeles. I had the chance to write about my favorite locations for elopements in Los Angeles and although not every rule for elopements applies to a wedding, I’d consider it a good read for anyone on the fence about choosing LA for their destination wedding. Los Angeles is a good choice for anyone who wants a destination wedding without the hassle of leaving the country and might have a bit more of a budget to work with. Once you’ve selected where you want to have your destination wedding, you’ve got to decide at some point who you should hire to capture it best. There’s a number of factors that go into the final decision but in my time searching for a photographer in addition to what the brides who hired me have told me about why they hired me, I’ve been able to narrow down the primary elements to consider in your process of hiring a destination wedding photographer. For a more nuanced look into what to keep an eye out for, make sure to consider other important factors for what to look for in a destination wedding photographer. I mention this first because it’s arguably the most important attribute to consider for your wedding. Experience naturally translates into competence and a photographer who hasn’t got experience under their belt is rarely more competent than one who does. I can’t tell you how many friends have told me they regret hiring a family friend with minimal experience because of a feeling of obligation because the photos didn’t turn out the way they’d envisioned at all. I will say, there comes a certain point after 3-5 years when the amount of time someone has been shooting matters less than the quality of their experience. A destination wedding photographer who has shot 100 weddings in 5 years is likely to be a better pick than another photographer who may have shot the same amount of weddings in 8 years. Wedding photography is like any other skill that atrophies with lack of use so if you have a friend who is a photographer but hasn’t shot weddings or anything like them for years, they may not be the right option. My final note is that experienced photographers do cost more but are certainly worth it. I’ll take the doctor with more experience every time, and the same goes for a destination wedding photographer! Wedding photography experience is important but my definition of experience is twofold – the second aspect refers to experience in traveling for destination weddings which is nearly as important. A regular wedding photographer from Boston who is ill-prepared for LA traffic and shows up an hour late, missing you getting ready and putting on your dress is not a situation you want to put yourself into. Making sure the photographer has shot destination weddings before ensures they’re well-traveled enough to take little things into consideration that a typical wedding photographer may not have thought of. I’ve heard horror stories from photographers about having their gear stolen because they wanted to save money on accommodation. Not knowing the safety level of the city they were in because of a lack of experience, they ended up in a dangerous part of town and woke up to their car windows smashed and the important (and expensive) contents in the seat gone. For any wedding, I’ve always said that it’s crucial for there to be a good fit between the couple and the wedding photographer, but it’s especially important for a destination wedding and I’ll explain why. For a typical wedding, you might spend 4-6 hours with the photographer, with the only break essentially being the ceremony, the meal, and a bit of dancing which isn’t as much time as it sounds. It’s not necessarily going out on a limb to say it’s important to get someone who you’ll enjoy having around for a huge chunk of one of the most special days of your life. A destination wedding cranks that intimacy to the next level with even more time spent with you the day before, sometimes the day after, and time spent with your closest friends and family. To have the typical feel of a distant vendor during that time the way you might with someone else wouldn’t necessarily work because it’d simply be awkward or uncomfortable. I don’t want to explicitly say they have to be ‘friendly’ per se but they should at least be open and easygoing enough to be able to have a positive effect on the environment rather than a negative one. Probably the most uncomfortable part of wedding planning outside of where to seat the guests is how who to invite, how many people you should ask to attend, and what to expect from your guests. As a destination wedding photographer, I’ve been a part of many difficult conversations and have consulted couples on how to approach this for an untraditional circumstance. Here are a handful of tips and considerations for you about your guests when it comes to a destination wedding. This primarily centers around what your budget is for the wedding. For most people, a destination wedding automatically shrinks the typical guest list size down because of the additional cost so be prepared to make 2 or even 3 drafts of the guest lists, with each one getting more strict about guests. It’s also harder to predict how many guests might attend because of the travel commitment so keep that in mind when crafting your list! If you’re second guessing who to invite a good rule of thumb is if you’d attend their wedding. In any wedding, there’s going to be guests invited who don’t live in the town you’re getting married, even if it’s the town you were born and grew up in. The nature of a destination wedding is that everybody is coming in from out of town, which is an entirely different situation to navigate. To impose a trip to family or friends isn’t always the easiest thing to ask, especially if your wedding comes with a hefty cost to attend. Inviting a family of five to come to a different country isn’t necessarily a trip most can attend without serious consideration and planning. My cousin sent out invitations for his Cancun destination wedding in 2007 but when 2008 came around and the economy wasn’t doing as well, he had cancellation after cancellation roll in. To sum up, keep the current economic status of the people you invite in mind! Be prepared for less generous wedding gifts, or even a lack of a gift at all from certain friends or family because of travel. Based on economic status, level of busyness, or family situation, not every guest you expect to say yes will be able to come. This applies for regular weddings but with the added level of financial and time commitment of a destination wedding the percentage of guests checking “yes” on their RSVPs is a bit lower. As much as I’ve written, I haven’t even begun to scratch the surface of everything that goes into a destination wedding. I gave 3 suggestions about where to have your destination wedding but didn’t mention any locations in Asia or South America, both of which have incredibly sought-after places to tie the knot like Bali or Cartagena, pictured above. I mentioned what to look for in a destination wedding photographer but didn’t talk about budget or creativity, which are often 2 other elements people consider high up on the list of what to look for and which I could write about for hours. Lastly, I brought up a few factors related to guests but can’t hope to capture the nuances of your exact situation which could be completely different from anything I wrote about. Ultimately, even the best guides are good for the middle of the bell curve but because there are so many exceptions, the best way to get to know your situation is with a conversation. I love to answer questions and give tips so reach out to me by call or text at 786-270-8527 or fill out a form submission and I’d be happy to continue the dialogue in person or over the phone. Make sure to get in touch with any other destination photography needs that may arise. Hope you found this information valuable and more importantly, I hope you’re a bit more prepared for your destination wedding!